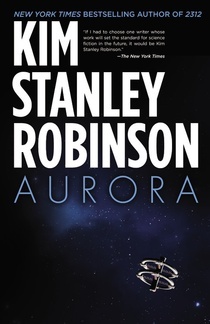 This massive science fiction novel is perhaps unique as a rather anti space travel work. The plot is fairly simple. A starship is despatched from earth to a prospective planet for colonisation in another nearby star called Aurora. The starship is lovingly described as gigantic containing a series of biomes featuring many types of earth environments and people. There are 32 in all with some 2000 plus people. Because of the massive distance of over 8 light years generations live and die in the biomes as the journey takes over 150 years. On arrival, after initial success, Aurora is found to be toxic with a tiny virus, a prion. Prions are newly discovered causes of such diseases as BSE and vCJD a few years ago. Near civil war breaks out among the prospective colonists with some wanting to attempt a settlement on another much less promising planet and some return to Earth. Robinson intimates that democracy fails with two diametrically opposed factions unwilling to compromise. The expedition splits into two parts with one staying, one returning. On the return journey the ship’s environment steadily declines so that the ships artificial intelligence takes over and the humans enter hibernation. The returners get a mixed reception. They find that space colonisers within the solar system suffer declines in health and reproductive vigour which are only reduced by periods spent on earth. Throughout the book the central character is Freya who becomes a form of leader by virtue of her descent from a well regarded engineer. The book concludes with Freya discovering the simple delight of playing at the water’s edge on a newly reconstructed beach and realising that Earth is effectively a giant starship which must be preserved. That is clearly the overall message of the book which is that space travel isn’t worth while and mankind’s efforts should be on the preservation of Earth. The book is very wordy with a great deal of philosophising. There is precious little science in this although the authors intentions are worthy and not uninteresting. I am drawn to tales of where the underdog fights back and triumphs, and this gripping read fits the bill! It dramatizes how Bob, after witnessing how his wife’s business associates deliberately destroy her credibility and career, avenges her by making them pay with the ultimate price, their lives. 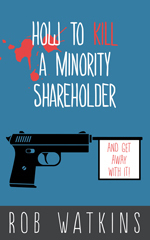 The first third of the novel illustrates how easy it can be for those in the corporate world to destroy the life and reputation of another human being. Bob’s wife, Deborah, a brilliant and successful businesswoman, has dragged herself up from her humble beginnings to reach top management. If Deb has a fault it is that she is too trusting of others. She is secretly resented by all around her, who use her to further their own careers, at the same time despising her for her competence and intellect. This hatred and jealousy goes so deep that one woman, the villain of the piece, Summer Ponsenbury actively sets out to destroy her, urging others to wield the knife on her behalf or sit passively on the side-lines. In many regards, the reader is presented with a very negative version of the human condition, delving deep into greed, jealousy, bullying, mental cruelty, violence and revenge. Yet the read is not devoid of humour, albeit much of it dark! Bob’s metamorphosis, as he goes from supportive and angry husband to avenger extraordinaire is at the heart of the final two thirds of the novel and the author executes the narrative with flair. It is up to the reader to decide whether or not the central character, Bob, is the hero or the villain of the piece. Many of the descriptions are very visual and this aspect coupled with the personal drama and humour make the book ideal for TV adaptation. The read will appeal to thriller readers who are looking for a satisfying read which delves deep into the psyche of its characters, is peppered with dark humour and which contains a serious message on human nature for us all. Find the author on goodreads, Amazon and FaceBook. Tina also interviewed Rob for LitFest. You can read the interview here.